JW was super easy to shop for this Christmas. We set a very reasonable budget because we have a wedding to save for and because we tend to buy everything we want throughout the year anyways. But you guys, I could have so easily blown the budget. I had so many great ideas for presents I could get him and I wanted to give him all the things. I have everything I need for him, but just in case you’re all having a busy December, like I am, and don’t have all your shopping done (sorry momma, I’m still working on you), like me, I decided to toss together a few gift suggestions for all of those great guys in your life. 1. Chromecast – I gave one to JW last year for Christmas and it was worth every penny. We have used it so many times you guys. From streaming movies from our laptops to the tv, to watching #FailArmy videos on Youtube with our friends. In fact, I love it so much, another special dude in my life may be getting on this year. Its a great gift, without a huge price tag. 2. Soundlink – My brother and I gave our Dad one for his birthday. He can play all his favorite songs by Bluetoothing it to his iPhone. Its loud and has a rechargeable battery so he can take it wherever he wants. And he loves it. 3. Pjs – JW is not the biggest fan of pjs. But even so, its always great to have a pair of comfy pants to lounge around in, on those he just doesn’t feel like getting dressed as soon as he gets out of bed. They come in particularly handy when we have guests and when we visit my parents at the cabin. 4. Essential Guy’s Cookbook – For the guy(s) in your life like mine who really enjoy cooking “manly” food. 5. GoPro – If there is anything on this list the men in my life would drool over, its this. They all have new snowmobiles this winter and can’t wait to take them to the mountains. This “gadget” would allow them to document their “adventures” in all their “epic”-ness. But sorry JW, this one was over budget, maybe you should have set it a little higher. Maybe next year. 6. Slippers – I gave a pair like these to JW for his birthday. I already had a similar pair and loved them. They’re super cozy and great to wear around the house, especially on our laminate and tile floors in the winter. 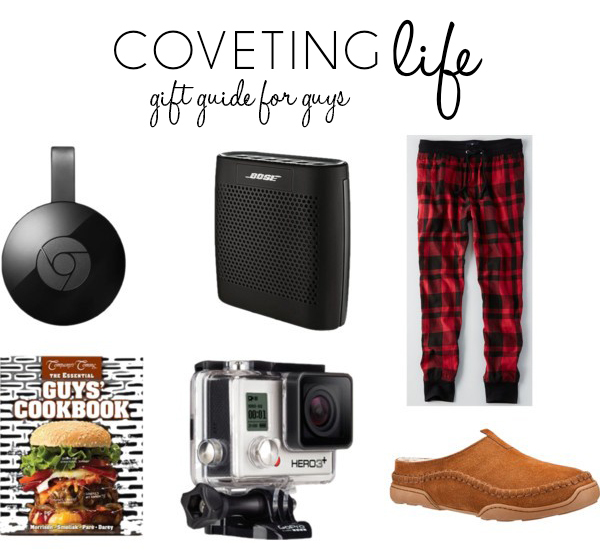 What gifts for guys would you add?